I love it. No plastics going into my mouth or the environment. I dont have to double up on floss anymore because its nice and thick. It does fray but its not made of plastic and thats a win for me! This floss broke on first use. Would not purchase again. I love the glass container and the biodegradable floss! I'm bummed that it frays and breaks more than other floss, but I'm still a fan! I purchased this floss because it seemed like a great alternative to standard floss that is wasteful and full of plastic packaging. I wasnâ€™t disappointed! 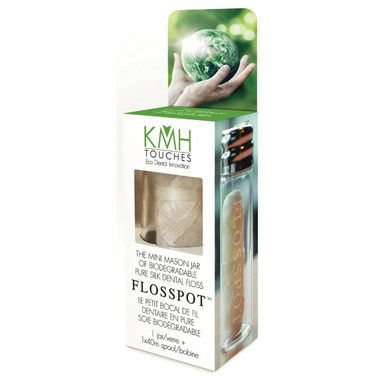 Feels just like regular floss but itâ€™s biodegradable - win win! Very cute, very well-made.... iâ€™ll be refilling this for a very long time! Excellent floss! Love an eco-friendly, biodegradable product. First time I have bought this floss. It is all the things I like - green, biodegradable and actually works! I bought the refills as well. I use more than once and wash in between before i put in compost. Will definitely buy again. Love this floss! I like that I can repurchase refills without having to constantly be purchasing all the packaging, and the floss itself is great stuff. I'm still on my first roll and it has been lasting me quite a while. I also love that this little glass jar holds up better than some other package conscious options I have tried, so I can pop it in my bag to travel or in my drawer at home without worrying it will come apart. I'd definitely recommend! I love it and it is sustainable considering we can refill the jar. Nice little dental floss. Great product that doesn't rip. Little glass bottles aren't the most sustainable.